I tend to fall in love with places. In the last few years, it was mostly Italy that has been capturing my thoughts, taking me back to places I've been to and arousing my imagination about places I haven't been to. Over the course of years, slowly but steadily I fell in love with Padua, its markets and shops, noble buildings and cafes. I fell in love with Venice- definitely not love at first sight, as it took me a couple of times to discover old Venice, a place where I could hear my steps on the cobbled streets, see the flickering light on the canals, enter the houses and workshops where centuries old handicrafts are still existing. Far away from the crowds, tacky souvenirs and touristy restaurants. I fell head over heels with Sicily, its peculiarity, its warm and curious people, its unique cuisine and architecture influenced by centuries of foreign rule. I fell for Umbria's hearty dishes, green hills, lake landscape and almost frozen in time hilltop towns, I fell for Matera's cave dwellings and humble history, I fell for the modern city of Milano and bare mountain peaks of the Dolomites. And this summer, as if returning back to Sicily wasn't enough, I was completely spellbound by the Western Sicilian island of Marettimo. Once again, watching documentaries and culinary shows took me to a place I wouldn't have heard about otherwise. Jamie Oliver went there to cook and learn from chef Giovanni Maiorana, we went there to eat at chef's La Scaletta Bar. 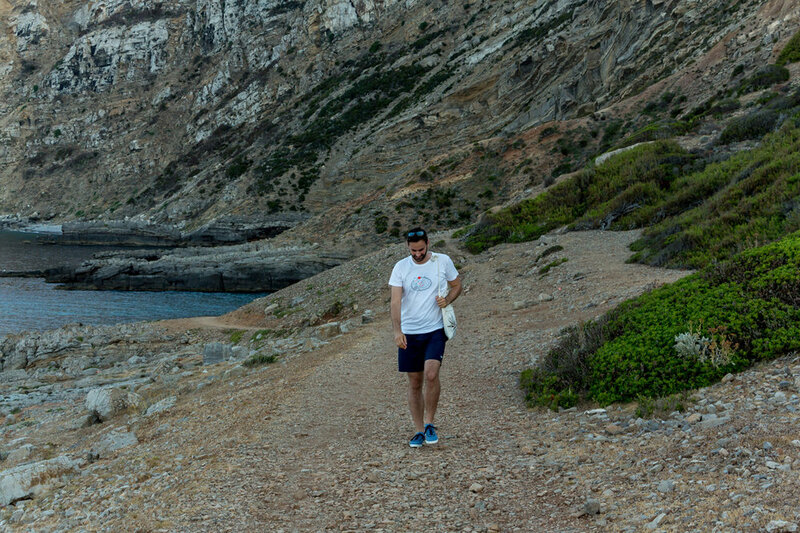 I knew close to nothing about the island, but it seemed remote and different, reminding me of Greek islands, with deep blue sea and white washed houses. So we booked three days on the island, with a plan to eat, swim and take it easy. 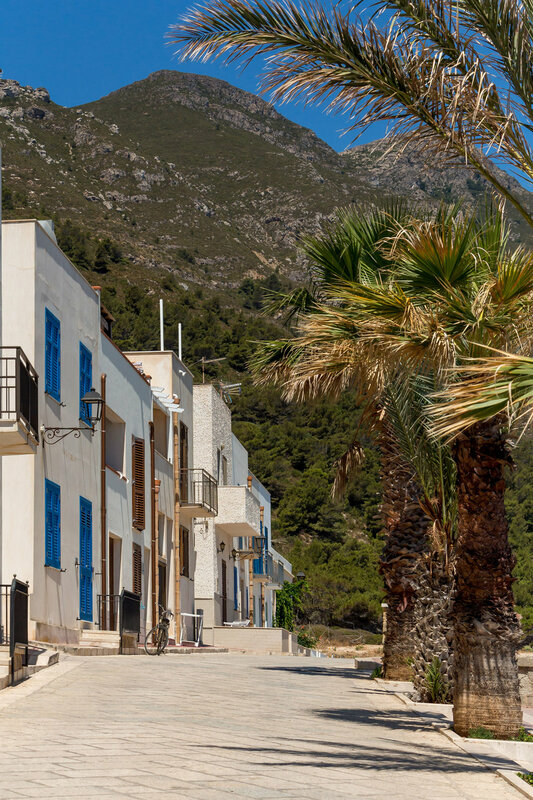 I was enchanted even before we disembarked on the island: the farthest and the least visited of the Egadi islands, Marettimo stood like a mountain rising up from the sea as we were approaching it. We have barely entered the village when we heard someone calling our names. 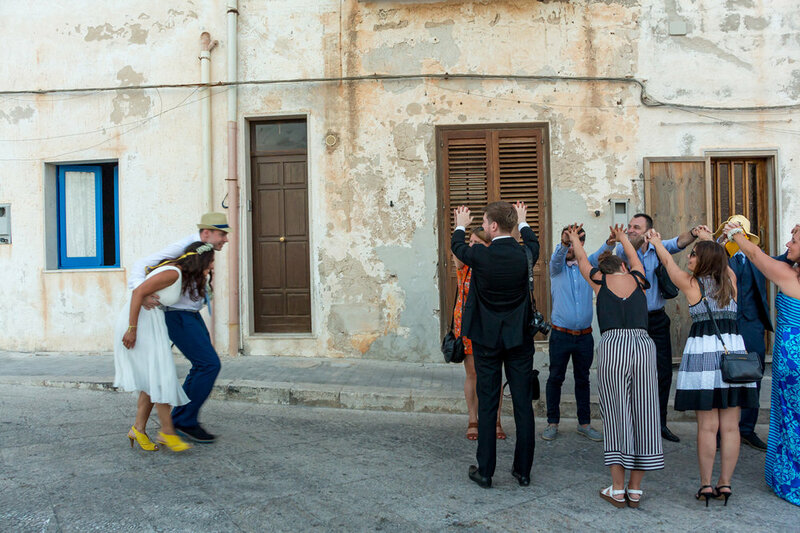 It turned out that it was our host and that on Marettimo, everyone seems to know everyone, even the newcomers. There was a party going on that evening, or better yet, a wedding of a Palermitan woman to an English man. You could feel excitement and anticipation in the air, the entire village looked festive. We met the wedding procession on our way to the beach, as they were having a ceremony in front of a tiny chapel overlooking the sea. There was a group of young people partying on a boat in the bay, and the music was so loud, and inappropriate for the moment, that the entire wedding stood on the rock shouting to them to turn off the music. The group on the boat eventually gave up. Late in the afternoon, we were the only people on the beach, where everything seemed different. We were surrounded by steep rocks, sitting on tiny dark pebbles, looking at the dark blue, almost grayish sea. As we took a swim, we felt excited, for the remoteness, wilderness, beauty of this place. And then there was a wedding that we decided to attend, or truth be told, crash. Just like the rest of the village. 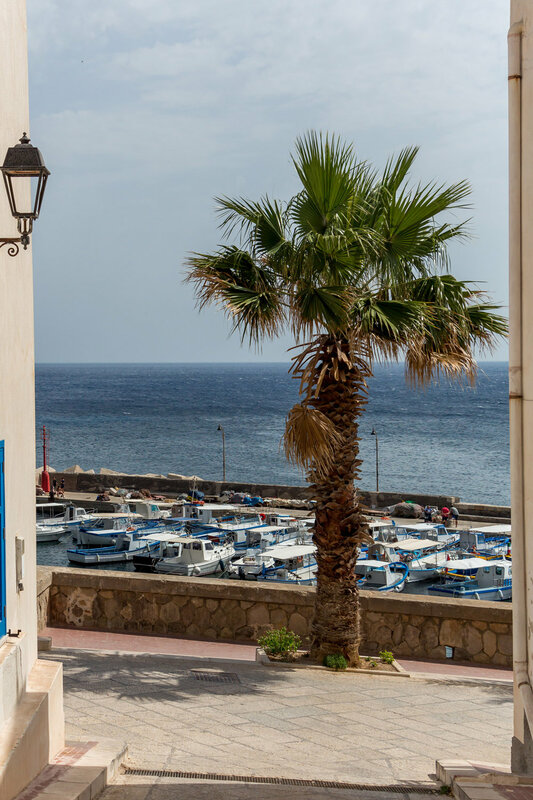 A rooftop of our B&B was a terrace, overlooking the village, the sea, the castle on top of the hilly peninsula to the north of the village, and the island of Favignana in the distance. We opened a bottle of wine brought from Marsala, and had one of those perfectly happy and careless summer evenings. Afterwards, we were ready for the wedding party that was going on on the main square. 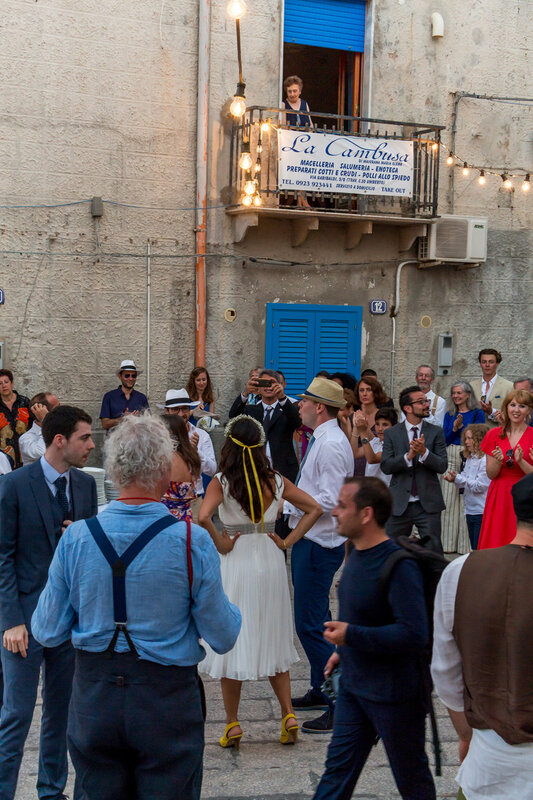 The band was playing traditional Sicilian songs, the bride and the groom were simply happy, dancing like nobody was watching. She had a beautiful dress paired with yellow shoes, a floral wreath with a yellow ribbon on her head. He wouldn't take off a funny hat that some of his friends had put on his head. When maid of honor approached us to stand in line for cake, that was exactly what we did. We shared a pistachio tart and then Luka decided that since we were at the wedding, we should dance as well. And so we did, to a mix of Italian songs, Enrique Iglesias and Murder on the dance floor. Oh, and the wedding reception was taking place at La Scaletta bar, a restaurant we came to Marettimo for. So we couldn't have dinner there on our first evening. We booked a boat trip for the next day, that took us to "giro del isola", or a tour around the island. Our captain turned out to be an interesting guide, knowledgeable and passionate about the island, its nature and history. He also served as an occasional photographer for the group of five funny, loud, middleaged Sicilians from Agrigento that came along. Even though Luka and I spoke Croatian between ourselves, they thought we were English, then if not English, French (? ), and then they were out of ideas, so the captain proposed Russian! I reckon that there are very few Croatians visiting the island. The sea was unbelievable. Deep blue as we were sailing, then turquoise and completely transparent when we anchored for a swim, intense blue, like a pool, in the beautiful bay called Cala Bianca. 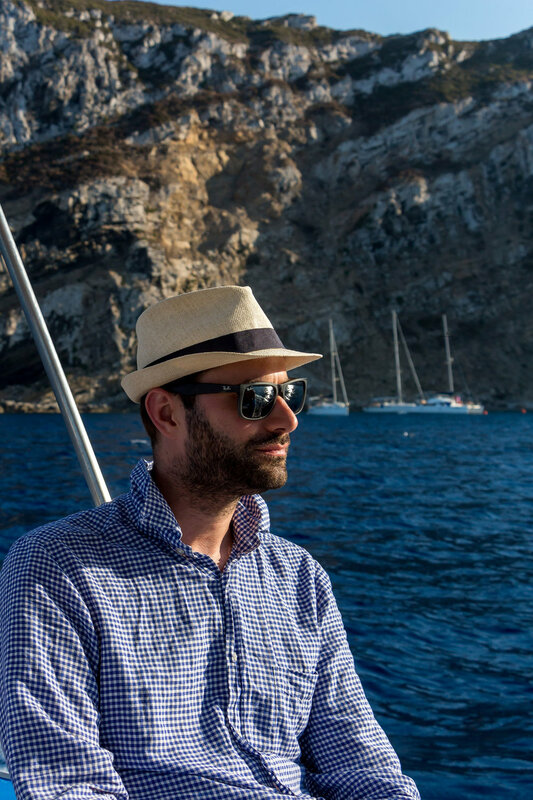 Captain Giuseppe took us to some of Marettimo's caves as well, spiced with the stories of pirates, hidden treasures, rare birds and the sounds that sea produces in the caves when the weather is wild. We passed by a fisherman along the way, who showed us two little fish that he had caught that day. We found out that he was luckier the day before, when he caught a really big one, and it was the talk of the village. We talked and laughed on our broken Italian (nobody seemed to care, as long as we could communicate, even with our hands, everything was fine), and by the end of the day each of us fell into a state of silent, delighted contemplation. We came back to the port when the sun was casting its last rays over the mountain, and the village was already in the shadow. That evening, we had dinner at famous La Scaletta Bar, where we were, like in some kind of movie, seated for a drink on a terrace overlooking the sea, and then when the dinner was ready, chef Giovanni rang a bell from the upper terrace, and the feast began. There is only one menu, 4 courses, a bottle of wine and water. That evening we had pasta with squid and figs (so delicious! ), fish meatballs in two sauces (tomato, and basilico), a grilled fish fillet (the same one that that fishermen I mentioned already caught the day before), and a nice selection of desserts we could choose from. We chose pistachio flavored, we were on Sicily after all. Most of the beaches we stopped at on our tour were reachable only by boat, and we decided to rent a small one for the next day. We bought some delicious focaccias and sweets in the bakery that was preparing everything in a wood fired oven, despite balmy June temperatures. We anchored in a bay we liked the most and stayed there for most of the day. Swimming to the coast and back, lying on little pebbles of the beach, at some points being the only people there. Accompanied by young seagulls that were peaking curiously from their nests. We are used to seagulls at home, but those looked like some prehistoric creatures, perched high in the rocks, approaching us very carefully, and observing us from safe distance. We took many photos, but none of them could really deliver the colour or the cleanliness of that sea. Our motor broke on our way back so we had to be "rescued" by a boy that the owner sent for us. We floated just a hundred meters from the dock, a bit embarrassed, but generally carefree, as it was a nice and calm day on the sea. 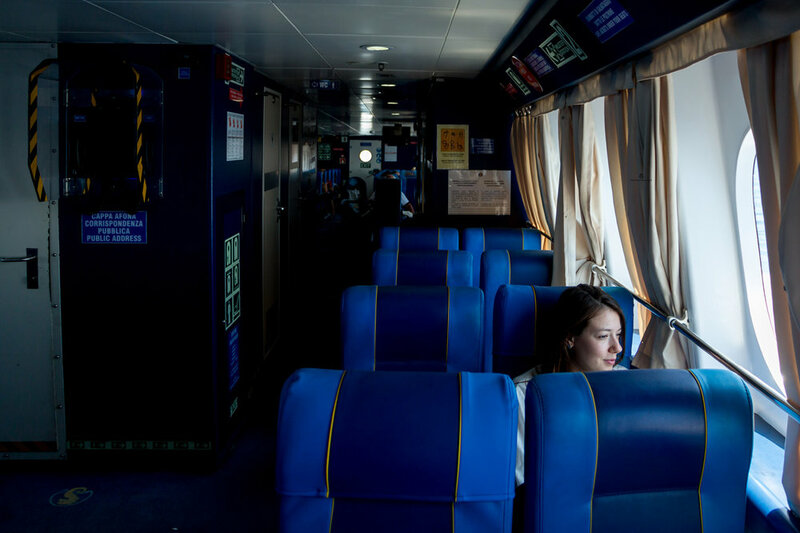 Unlike the next day, when we had to head back to the mainland. Even that evening, the sirocco (or the southern wind) that was approaching us was the talk of the village. 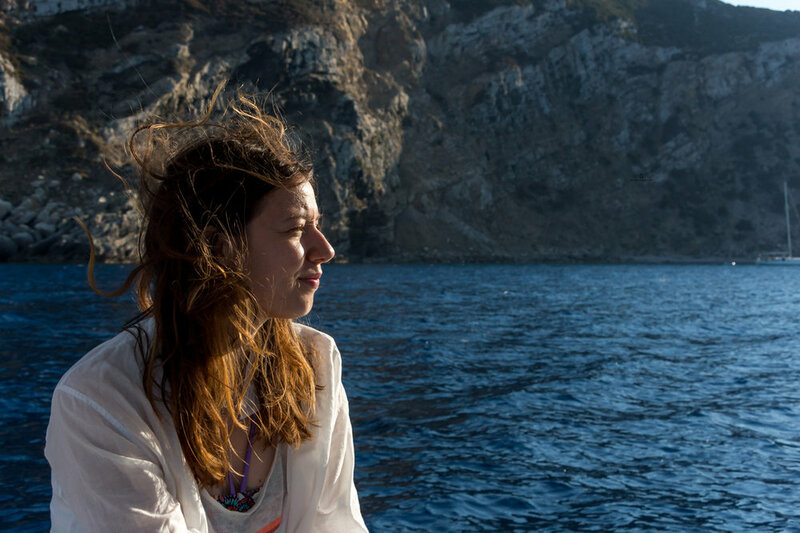 It was the highlight of every conversation we heard, and really, the waves were so high on the day of our departure that I am still wondering how we managed to get to Trapani without feeling sick. We must have still been under the spell of Marettimo. La Scaletta Bar- if you find yourself on Marettimo, surely you will find yourself in La Scaletta Bar as well. I don't have any suggestion but to try out and enjoy everything that chef Giovanni brings to your table. La Tartaruga B&B- the best B&B we could have hoped for. Simply, nicely decorated rooms, delicious breakfast with homemade cakes, fruit salad, and delicious pastries. Rooftop terrace overlooking the sea with a glass of wine. Friendly owners that served us ham for breakfast when we wished for it, and washed our clothes when we asked them so. Bar Baia del Sole- an unassuming looking bar that was almost the only thing open for lunch on our first day. The waiter (maybe also the owner) turned out to be an excellent cook, so we went there for lunch and a beer each day. Fried aubergines filled with cheese, baked pasta with ham and tomatoes, la caponata (delicious Sicilian vegetable tomato stew) were on the menu depending on the day. Panificio L'Antico Forno a Legna- a bakery with wood fired oven that I mentioned before. On our first day they didn't have any change so they just loaded us with focaccias and sweets and said, "It doesn't matter, you'll pay us tomorrow", even though they've never seen us before. We were regulars for the next two days, because those pastries were something else, even for Italy. Horizon Marettimo- boat tour company that organizes sails around the island. A day trip with captain Giuseppe was worth every cent and I couldn't recommend him more, as a guide and generally as an interesting person to talk to. If you want to read more about our Sicilian trip head here and here. Here is a short video from our trip (wedding crashing included), let me know what you think!